The Milton spring rocker was the debut chair in our organic Living Home Furniture™ line in 2008. Named after my grandfather, the design recalls his favorite chair – at least as I remember it from early childhood. He used to sit in it as he enjoyed the Boston Red Sox on one of the first color TVs in the 60s. The cover fabric is beautiful hand dyed, hand woven silk from a weaver’s co-op in Thailand. 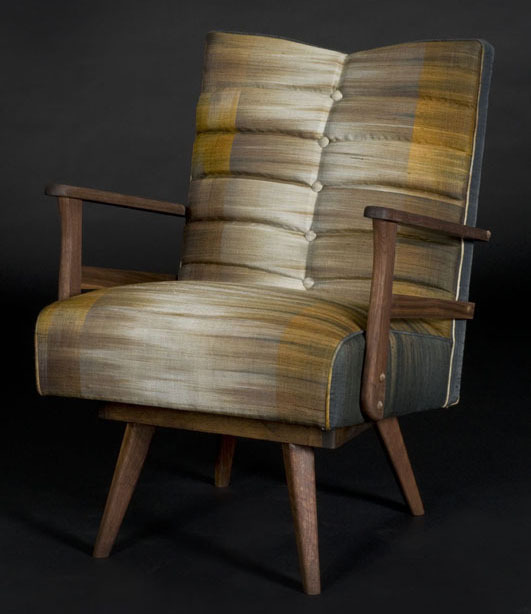 Unfortunately, it is a limited edition fabric, so is not currently part of our stock fabric offering – but it seems almost meant for this chair. The upholstery includes local organic wool batting and felt, 100% natural latex foam, organic cotton/bamboo batting & hemp canvas. The arms and base are FSC certified solid walnut, finished with pure tung oil (no petroleum distillates) and beeswax.